You worked hard, just completed the initial substantial financing for your startup and have the financial resources to take your solution to market. You now need to plan and execute your short-term product features to attract early users, fuel initial sales and build references for other customers. At the same time, your roadmap should enable you to address larger markets in the mid-term, while managing overall business risk. We will talk with Diego Casadei, Head of Space R&D at Cosylab. He will draw from his broad experience in space instrumentation, including two cosmic-ray detectors, one operated on board the NASA shuttle Discovery in 1998 and one installed on the International Space Station in 2011, and two X-ray imaging spectrometers for space, one on board of the ESA Solar Orbiter and one currently in development. In addition to project management and system engineering activities, his technical contributions range from detector R&D to the design of trigger and data acquisition systems, from instrument characterization to space qualification, from simulations to performance studies. We will also draw from our broad Entrepreneurship experience to provide exciting insights and practical examples. You will have the opportunity of a live chat to ask relevant questions. Register below for this Webinar on April 10th 2019 6:00pm to 7:00pm CET! In November 2018, Tendayi Viki was asking again in Forbes “Why large companies continue to struggle with innovation?” – a recurring question for too many years. We do not pretend to have the magical recipe for Innovation. However, our daily work with both large companies and startups gives us a unique perspective on closing the Gap for putting “Innovation” in practice. At the same time, from B2B Tech startups, and the frustration of “Innovation Labs” disconnected from the priorities of the Company’s core business. Several months into meetings, negotiating proposals and running Proof-of-concepts, the initial excitement for the “innovative” solution is often buried under business lack of focus, day-to-day priorities, one-off pilots and red tape. In this paper, we will uncover together 3 challenges on a path to true Innovation-for-Growth. We will also articulate 5 specific actions companies can execute to achieve sustainable Business Growth. Challenge #1 – it’s Innovation Magic! Remember how you watched the latest Magic show? Like a kid, you probably experienced a mix of Delight, Wonder and Superiority! Delight – we are wired to be in awe of things that cannot be logically explained. Wonder – we know these things are fantasy, but if magic is real, then maybe all kinds of other cool things that we want to believe are real, too. Superiority – while there are some people who watch magic with wonder, there are plenty of others who get off on their perceived superiority to the magician. They can figure it out. .
Today, Innovation is like watching a magic show! Delighted by the Technical novelty, we join the crowds of Innovation Summits & Tourism, Startup festivals and Pitching competitions. We know many of these things are fantasy but also wonder how it could work for our company. The first thing we burn to ask the Magician is “how did you do this”? Under pressure from shareholders, customers and competition, each business needs to “Innovate”. As so often, Managers focus on the easiest part of the equation – the How. We send people to training to acquire and learn the method and tools. We establish Innovation Labs, “Silicon Valley Outpost”, Accelerator, Incubators and often even hire a Chief Innovation Officer! And then we outsource the essence of Innovation to external providers or “innovation-as-a-service” consulting firms, with the promise that you too can innovate … efficiently! From this, the “Innovation Manager” feels free to share deep insights travelling the world, giving keynotes about Innovation at the ever growing audience of Innovation Forums. Our business world is full of research and analysis that are comforting to managers: that success can be yours by following a „Innovation“ formula, that specific actions will lead to predictable outcomes.Innovation is one good example of “The Halo Effect” where the perception of one quality is contaminated by a more readily available quality. In this case, Innovative companies being rated as more performing when promoting Technology innovation. So what we should do instead? Build on your business and management strength. Stop focusing on Technology Push “Innovation” and instead address the key hurdles on the way to sell a new product or solution into the market – User Adoption. And be ready to transform your company in a challenging but rewarding process! Established companies have a deep market experience, established channels and long standing customer relationships. From there, Managers are best positioned to identify user’s problems, both internal and external. B2B Tech startups engage in Proof-of-Concept with prospective customers to offset their lack of “track record”. For larger companies, this PoC can also be a fantastic opportunity to (re)discover their customers, adjust features, increase value capture – and secure user adoption along the way. Most companies have established a functional, geography or product-driven organization or a mix of all. Many also have or thinking of establishing a Chief Digital / Innovation Officer. One particularly useful organization is along the Customer Journey including a Customer Success team or some people committed to a great product value experience. These customer-centered teams are key in ensuring customer maximize value from new products. More importantly, embedded in the New Product development teams, they can provide invaluable insights to for new user-driven product innovation while increasing value capture! Once the customer insights are flowing into your organization, the true business growth will come from implementing the new product or solution features. This phase will rely on a higher tolerance for Risk and the proper frugal mindset or Jugaad. Methods such as Agile process to execute and iterate evolving product features over time can be helpful. This is done sometimes under a separate organization with required “Air Cover” to protect from interferences while also giving marketing freedom with eventually a distinct Brand. New products require also new sales processes, capabilities and metrics. First you will need to invest more qualified sales people time for Inbound vs. outbound sales and Solution vs. Product selling. The focus is on establishing a long-term relationship and on ensuring your customer is deriving sustained value from the solution. e.g. Partnerships and network effects. When we work with a Startup, we define what are Key Performance Indicators and identify Solution-selling talent. While the solution might be new, the KPIs are generally well established in the given market but might be quite different from the established Company core business! For many large companies, hiring the required talent, particularly round “hot new tech” such as AI, Cloud computing, Software Development is a real challenge. We rave at the GAFA & Co. and their incredible ability to innovate and grow. 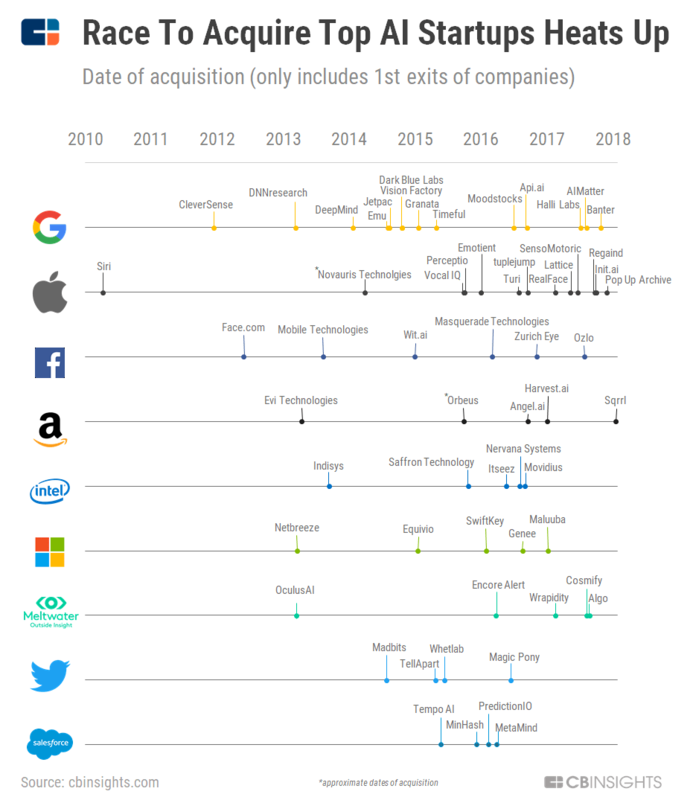 We should not forget that most AI solutions the GAFA are now deploying to the market are arising from many Product & Talent-driven acquisitions over the past 5 years. Used properly, Innovation marketing and “Acquihire” can be powerful tools to evolve the way your company culture, customers, employees and new hires image. And of course Mind the Gap between Innovation and Adoption! Looking forward to your comments, questions and feedback ! After numerous pivots, sleepless nights and uncertainty, you’ve survived the chaos and crushing ambiguity of start-up life and managed to develop a unique tech idea or already patented an offering for customer. You are bootstraping your venture through project consulting while further developing your new product before scaling up. But the same strategy that got you through the initial start-up stage, is not working anymore. Still wondering why? Tech companies face different challenges when it comes to scaling up and coping with risks at various stages. A startup is on the quest to find product-market fit, developing and iterating its product or service, experimenting with customer segmentation and working toward a positive contribution margin. A scaleup, on the other hand, has already validated its product in a market, and has proven that the unit economics are sustainable. In-house Scale up – Develop and test the product in-house. Upon successful development and validation, set up production unit and selling through own channels. Outsourcing a function of the business – Letting an external partner handle the function, for eg. Marketing or HR or production, to get expertise in the field. Licensing – Licensing a well-developed technology to another company / person and charging a royalty fees on the Net profits or revenue-share-agreement obtained through implementation. Time-to-Market – Depending on the stage of startup, competition and strength of IP, licensing can be a fast track route to get your product in the market faster. Team capabilities – Available expertise and experience of your team will confirm the capabilities to produce inhouse or with partners; this allows you to focus on your core strengths, avoid the challenge to develop expertise across the board. Access to capital and Return on Investment – Licensing requires much less investment and time as compared to in-house development. The access to adequate capital is often a key driver in strategy decision. Once you have chosen a strategy based on above factors, below are some key steps to consider on your path to implementation. Research the environment and current situation – Assessment of external environment is critical to know your market, know the bigger picture and the challenges you might face. Build a plan based on the idea and selected strategy – Assess you core competencies, adopt your business plan in line with the selected strategy and capabilities of your team, set KPI’s and a clear roadmap for the future. Outsource what is non-strategic to optimize leverage – find the right partners, for non- essential activities and focus on leveraging on key capabilities. Scaling up is not only about leveraging internal capabilities but also outside resources. Strengthen your team to support core capability – Recruit more people to strengthen special know-how and broaden the Management skillset of the team. Leverage your network to build collaborations – Network plays a key role in building the trust with the partners for your idea. Leverage your existing network to find the right partner with required competencies to scale up your idea. A plan, no matter how strategic, is only a plan. The success of scaling up depends on actual implementation but also the ability to react to changing market conditions. As per the 2017 European Scale-up report, contrary to Silicon Valley, where 2 out of 3 startups are consumer oriented, 60% of European scale-ups are B2B focused. Initiating, building and maintaining productive relationships with large customers are challenges for many startups. To become successful at driving sales in a Business-to-Business environment, it is critical for any Entrepreneur to first accommodate to a very specific operating framework. Large customers are primarily assessing new innovation against Return on Investment, validating how it will help them increase profitable sales. In the background, the Entrepreneur will have to establish deeper relationships with a small number of companies. A further focus will be to cater for a Person-to-Person selling across multiple stakeholders. And above all, to be patient, acknowledging slower decision process of large organizations. To prepare for the sale, it will be critical for the Entrepreneur to get-out and understand the industry structure and its dynamics, so also to articulate a solid, simple Value Proposition. Beyond the market focus, it will also require to research customer organization and identify the true decision makers, their readiness to pay and seek early adopters. During the sales process, it is very critical to listen to customers, so as to deliver what they need. To build credibility, the Entrepreneur will need to apply full human resources bandwidth to gain management trust, similarly to Venture Capital discussions. During this critical phase, the focus should remain on key contract items: scope, liability, IP ownership and termination terms. The Entrepreneur should always be weary what its organization signs and seek legal advice whenever appropriate. The management of the post-sales process is a fundamental building block to success. The Entrepreneur will have to expand its discussion and reach to other functions within the customer organization. It should be useful to consider implementing a Key Account penetration plan but also some simple but effective web-based sales pipeline management tools. Finally, the Entrepreneur should ensure not to be blindsided by the urgency to get the order on the table and prepare for the next sales opportunity. Roberto Magnifico, Chief Commercial Officer, with the Startup ActLight SA. He draws from his broad key account sales and senior management experience to provide exciting insights and practical examples. You will have the opportunity of a live chat to ask relevant questions.